After several years on the comedy circuit, and landing television appearances on 'Saturday Night Live' and performing with Second City in Chicago (Brett hates name dropping, so we won't mention his stints on 'Law and Order', Comedy Central, and 'Commander USA', just to not name a few), Brett learned that you should try and perform to the highest level of your intelligence and go beyond that to your audience's level. (Yeah, right!) 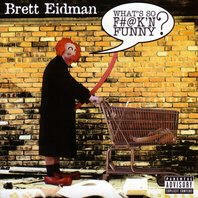 Anyway...his career led him to this debut comedy recording, What's So F#@k'n FUNNY?